Some months ago, an Australian TV journalist contacted us about doing an interview after the Jordanians rejected a US request to extradite our daughter's killer. The felon, a Jordanian woman called Ahlam Tamimi, murdered 15 innocent Israeli civilians, most of them children, in the bombing of Jerusalem's Sbarro pizzeria in the summer of 2001. She did this on behalf of Hamas as its first-ever female jihadist. 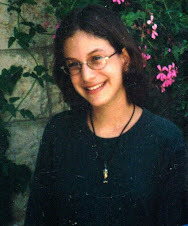 Our daughter Malki, 15, was one of the people she killed. 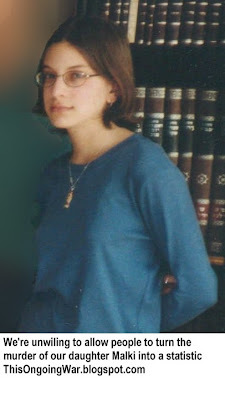 In 2011, as part of the Shalit Deal, she was set free and returned to Jordan where her family lives and where she was born, raised and educated. The State Department's official listing of valid treaties ["United States Department of State | Treaties in Force | A List of Treaties and Other International Agreements of the United States in Force on January 1, 2017" at page 240] includes the one with Jordan, stating that it "entered into force July 29, 1995". No suggestion that the US sees any legal problems with it. The Department of Justice have confirmed to us that the treaty is valid and in effect. 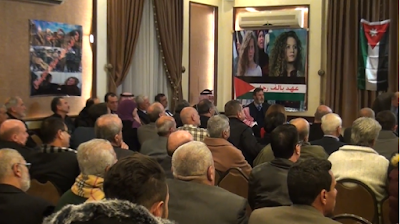 Tamimi had been told by Jordan's government to lower her profile for a while. In simpler terms (our words) if Jordan was going to stick its finger in the eye of its American strategic ally, protector and benefactor (as it has and as it continues to do), it would be prudent not to publicly flaunt the gift of freedom that King Abdullah has given her. It's good to know that though it likes to call itself a constitutional monarchy, Jordan operates more like an absolute monarchy. If King Abdullah wanted Tamimi extradited, she would be have been shipped to Washington the same morning. Last weekend, in response to the intense media attention on Ahed "Shirley Temper" Tamimi, the Jordanian media reported on a public event that took place in Amman. (For some excellent background, see "Why Is No One Talking About Ahed Tamimi’s Call For Stabbings?" in Forward, January 4, 2018). Some prominent Jordanian speakers were in the line-up which was heard by an audience filled with elderly men. Also: some women. What caught our eye is that one of the speakers was Ahlam Tamimi, the mass-murdering fugitive jihadist in the flesh. If anyone has a problem with our way of telling it, let them point us to Jordanian voices calling publicly for an end to the shame and embarrassment of Jordan openly harboring a confessed murderer of children who's on the FBI Most Wanted Terrorists list. There aren't any. Last weekend's event was 'modestly' titled “The Festival for the Support of the Jerusalem Holy Sites and the Palestinian People and Declaration of Solidarity with Ahed Tamimi”. 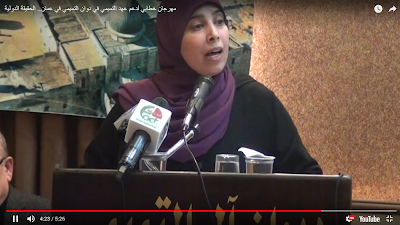 There's video coverage of the event and the speeches (all in Arabic) on YouTube (Ahlam Tamimi starts at about the 4 minute mark). We haven't found any English-language reports from any Arabic source yet. Some might see that as significant. "The Zionist Project wishes to remove the Hashemite supervision of the Aqsa Mosque, and the response should be to terminate all the agreements and treaties with the Zionist enemy. "Jordan should use its influence to confront the American-Zionist plans in all areas." "Ahed Tamimi is experiencing loneliness and sorrow in the Zionist prisons, which Ahlam has experienced herself, in addition to the numerous female prisoners and children prisoners into whose cause Ahed has breathed new life. The thing we want to emphasize is this. Very prominent Jordanians, members of the country's political elite, have no problem sharing a public platform with a confessed killer of Israeli children who is also an FBI fugitive and the subject of American efforts to have her extradited to the US to face serious federal charges. Can you imagine this happening anywhere else? She's a wanted criminal but not in Jordan where she's a hero. Taher al-Masri, a Palestinian Arab who served briefly as prime minister of Jordan said Arab claims to Jerusalem and Palestine concern not only the Palestinians but every Arab, every Muslim and every free person in the world. He called on the Arabs to support "our people in Palestine" and come to "the defense of the Islamic faith that is the basis of the concepts of our societies". Ahed Tamimi, the blonde girl from Nabi Saleh, "represents the spirit of Palestine". It is "no longer possible for us to remain silent on what is happening to Jerusalem and the Palestinian cause." And some anger directed at America: "The transfer of the US embassy to Jerusalem is the second stage of the Zionist project, America's recognition of Greater Jerusalem as the capital of "Israel" (quote marks are in the source text) meaning that Jerusalem is no longer part of the occupied Palestinian territories". He gave voice to a favourite Palestinian Arab theme - a Jewish Temple is going to be be constructed over the ruins of what he called "the Al-Aqsa Mosque". Saleh Armouti, a member of Jordan's parliament (we quoted him here last year) and one of Jordan's most prominent and noisy Islamists: "The American assistance and aid can go to hell if it will cost us our dignity." He's a man who's bothered by what he calls "shameful Arab silence" in the face of attempts to divide Palestine and Jerusalem which "are one and we do not accept any division between the two". Armouti is enraged by the "occupation" of what he called West Jerusalem which makes up 80 percent of Jerusalem. And another serve to America which, he said, "is a partner in the aggression against the Arab and Islamic nation. It must be boycotted and Trump should be tried before the International Criminal Court". 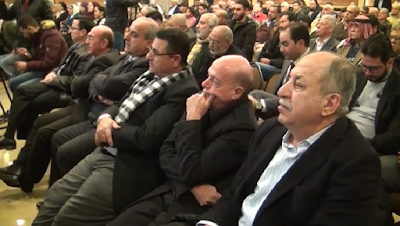 Khamis Attia, deputy speaker of Jordan's lower house of parliament (and was the prime mover in an effort to get energy-starved Jordan to cancel its gas-importing deal with Israel in 2014): Jordanian anger over Trump's Jerusalem decision, he said, is great and the position of His Majesty the King on Al-Aqsa Mosque and on the Trump decision is honorable. Rula al-Hroub, a prominent former MP and (we're fairly sure) also a Palestinian: Praised King Abdullah "and the Hashemite leadership" on their resistance to the Trump decision. Wants the Oslo Agreements "to be brought down". "Palestine is Arab Muslim from the river to the sea and no one has the right to relinquish it, or any part of it." Tamimi was born and raised in Jordan. She was sent back there when, despite the 16 terms of life imprisonment ("with no possibility of parole or early release" in the words of the judicial panel that had sentenced her) she hit the jackpot and was freed by Israel in the catastrophic Gilad Shalit Deal of October 2011. She married soon afterwards to a cousin who is also a convicted and freed murderer and a Tamimi like her. She has been living in Amman, Jordan ever since. In March 2017, the United States announced that Federal charges had been brought against her, she had been added to the FBI's Most Wanted Terrorists list and the US had requested Jordan hand her over for prosecution under the 1995 Jordan/United States extradition treaty. Jordan refused and has continued to maintain its refusal. She lives free as a bird with no suggestion by Jordan it will prosecute her itself under Jordan's criminal code or in any way abridge her freedom of movement. The all-powerful king of Jordan has powers that include appointing the judges, rotating the parliament at very frequent intervals and controlling the media. In its 2017 report, Freedom House rates Jordan's media "Not Free", ranking the country at 150 in a table of 199 countries. Some of Jordan's friends in the US Congress might want to reflect on the implications of that and Jordan's derisory response to a US extradition request when they review relations between the two countries. Also: that the murder of two Americans - one our daughter, one a tourist visiting Israel briefly with her husband and pregnant with her first child - mean nothing to the people, government and courts of America's Jordanian ally. They're with the loathsome Tamimi clan of Nabi Saleh and let no one have any illusions about how that works.